Unless you keep using them in college or you job, most of the facts and formulas you learn in high school will quickly fade from your memory. Students who were big enough wise-asses to point this out to their teachers probably got lectures about learning critical thinking or study skills they need for college, but your classes are just another part of the biggest skill you can learn in high school: time management. Teachers give out huge amounts of homework and expect students to be prepared for frequent tests while they’re also juggling extracurricular activities, newfound responsibilities like a job or caring for younger siblings, finding time to hang out with friends, and ideally getting a reasonable amount of sleep. Something has to give, and prioritizing is something that’s far from obvious to adolescents, or even adults. That dilemma is brought to life in Atlus’ Persona 3 and Persona 4, which have characters attending high school by day and fighting demons by night. Plenty of role-playing games give you some level of choice as to what abilities to prioritize, usually letting you improve things like a character’s strength or speed. The brilliant twist in the latest Persona games is that you build up your character based on how they spend their time. Fighting monsters in Persona 3’s Tartarus or Persona 4’s Midnight Channel provides the straightforward rewards, leveling up your characters and the Personas that give them magical powers. But there’s also significant power to be gained by studying, hanging out with friends, working a job, joining after-school clubs or sports teams, and even taking up hobbies like gardening or fishing. Like in real life, the benefits to trying any given thing aren’t especially clear until you do it. The most important thing about joining the volleyball or basketball team is that you make a new friend, manifested by the game’s “Social Link” system, which unlocks benefits based on how much time you spend with certain characters. Fishing can get you special equipment for your team, and taking a part-time job can not only earn you money but also raise your courage if you show you’re bold enough to work at a creepy hospital, for example. There are even statistical bonuses to be gained by doing karaoke or catching a movie. Nothing is a waste of time, but everything takes up time. Each game has a different approach to giving your choices consequences. Persona 3 emphasizes the importance of sleep, the thing that high school students are perhaps least likely to prioritize. If you spend too much time fighting through Tartarus instead of getting a good night’s sleep, you’ll become tired, performing worse in combat and gaining less benefits from studying. When your friends are tired, they won’t want to go to the dungeon with you, instead opting to rest and recuperate. You can push your hero to keep fighting, but that comes with the risk of getting sick, which reduces your abilities even further, makes studying impossible, and takes longer to recover from. The portable version of Persona 3 added an extra level of realism, letting players banish exhaustion with an item dubbed Yawn-B-Gone that one can only assume is Red Bull or whatever other caffeinated beverage you became addicted to in order to survive high school. 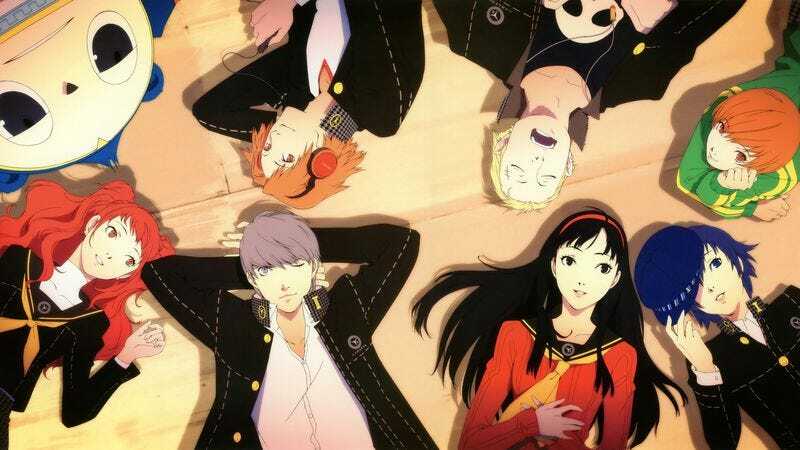 Persona 4 ditched those ailments and instead gives players deadlines. The shadows in the alternate reality known as the Midnight Channel will kill anyone who’s trapped there when fog rolls over your hometown, which means the weather forecast serves as a deadline for rescuing whoever’s stuck there at the moment. The responsible thing to do is plow through each dungeon as soon as it becomes available and then devote the days before the next one shows up to socializing and other high school activities. But it’s easy to fall behind if you get distracted by a new store opening up or think you can just spend one more night buffing your stats or building your Social Links to make a pending boss fight easier. Then you wind up cramming your exploration, unable to leave the dungeon to recover health and magic because you can’t afford to sleep and let the calendar tick forward another day. It’s easy to imagine a version of Persona that goes even further to replicate the high-school experience. As it stands in Persona 3 and 4, if you blow off your job or a drama-club meeting to hit up a hot spring with a friend, you’ll miss out on the bonuses you would’ve earned by showing up but you also won’t be fired or kicked out. You’re never forced to skip a chance to socialize due to a family obligation and you won’t get in a big fight with a friend because you never hang out anymore. That might produce a much greater challenge, and a lot more stress, than even the toughest boss fight. Detailed guides have been written for both games that explain the benefits every action will provide and the best way to spend every hour of every day to get the strongest party possible. That works well for risk-averse or optimization-focused players, but it cuts out the spirit from a game about choosing between fun and responsibility without fully grasping the consequences of your actions. It’s hard to predict what the most important things in your high-school years will be. Studying to get good grades might help get you into the college of your choice, but the friends you make and the interests you discover can also have a dramatic impact on your life. The best you can do is try to find a balance and spend the time you have wisely.